Pedro Maura holds a law degree from the University of Deusto (1972) and an LLM in law from the University of Southampton, England (1975–76). Pedro was an arbitrator for the Commerce Arbitration Tribunal within the Chamber of Commerce, Industry and Navigation of Bilbao (1990) and an arbitrator for the European Network for Dispute Resolution in the area of Euro Arbitration (2000). He is a member of the Spanish Maritime Law Association. Between 1973 and 1975, Pedro worked for Maura & Aresti Ltd, ship agents and insurance brokers, in the vessel dispatch, canvassing, freight closing and claims departments. In 1976, Pedro joined the Bar Association and in the same year joined Fernando Meana Green & Co. He became a partner in 1978. Pedro has more than 40 years of professional experience and has worked on numerous cases of maritime law, maritime employment law, international negotiations, litigation and arbitration, both nationally and internationally. F Javier Zabala is head and legal director of the Meana Green Maura & Co office in Bilbao. He has a wide experience in shipping and transport matters. He is specialised in wet and dry shipping as well as in road transport. His clients include shipowners, P&I Clubs, freight forwarders, marine underwriters and contactors and service companies in the offshore energy industry. His practice covers all the firm’s main contentious practice areas such as shipping, energy and offshore, international trade and insurance and reinsurance. He also has a particular in-depth experience in the law and practice of pollution from ships having been involved in some of the most relevant oil spill cases in Spain. Javier is a frequent speaker on shipping and transport law seminars both in Spain and abroad and he is a professor in shipping and international law at University of Deusto (Bilbao) and ISDE (Madrid). Pedro Maura and F Javier Zabala: It is undeniable that Spain has a privileged geographical position in the world. Being located at the gates of the Mediterranean Sea, with access to the Atlantic Ocean, the Bay of Biscay, having a frontier port at the Strait of Gibraltar, and one of the last ports on the way to the Americas (Canary Islands), has undoubtedly benefited Spain in terms of both the shipping trade and the fishing market. These, along with other relevant reasons – Spain has one of the longest sea coasts of the world (7,268 kilometres according to the World Resources Institute) – has ensured an ancient marine tradition and a great interest by Spaniards in the sea and the benefits that can be obtained from it. With 2,300 vessels registered at the Spanish Ship Registry (200 more than in 2015), in 2017 – according to Spanish State Ports – Spanish seaborne trade grew by 6.4 per cent, up to 361.8 million tonnes (MT), while for general cargo it increased by 4.8 per cent, up to 122.6 MT. It is remarkable that these figures do not take into account international transit, which totalled 51.7 MT (11 per cent more than the previous year). As far as the container trade is concerned, according to the EuroMediterranean World Container Map 2018, Spain has six ports ranking within the 50 more important ports of the Mediterranean by containers, having transported over 117.51 million 20-foot equivalent units (TEUs) in 2017. Together, ports of Algeciras and Valencia received almost 50 million TEUs in 2017. In 2018, these figures are expected to increase considerably. Not only is the transport of goods’ market is Spain thriving, but shipbuilding also keeps increasing. A good example of how Spanish shipyards are improving their production and benefits is the semi-private shipbuilding company Navantia. After having suffered great losses during the 2008 economic crisis, the company has been able to turn its luck, and is currently building army ships for the Spanish Navy as well as for foreign countries’ navies (such as Saudi Arabia and Australia). The company has introduced in its production some modern tools (ie, 3D printers for complementary elements of the vessel) and is developing a new concept called Shipyard 4.0. Another key sector of the shipping trade in Spain is the transport of passengers, which is directly affected by tourism and the peninsula-islands transport. In 2017, Spain surpassed the United States to become the world’s second most visited country – behind France – being visited by almost 82 million tourists, who spent almost €87 billion in the country, according to the UN World Tourism Organization. It is also worth mentioning that Spain – as a member of the EU – is the country that most benefits from the EU’s aid and investments. Between 2000 and 2013, Spain alone received almost 40 per cent of the total funds invested by the EU in member states’ ports (€6,800 million). For a country with only 46 million inhabitants and a GDP of US$1.3 trillion in 2017 (2.12 per cent of the world economy), it is safe to say that the above-mentioned data shows the Spanish shipping market is clearly thriving. PM & FJZ: For the maritime industry in Spain, 2017 was a successful year and the prospects for 2018 are also encouraging. Apart from the general increase of container-trade in Spain, another sector that has grown exponentially is the cruise sector. For the first time in its history Spain surpassed 9 million visitors coming on board cruise vessels in 2017. If we talk about the number of Spanish cruise passengers, Spain has become the fourth most important market in Europe, overtaking countries like France. In general, the turnover generated by the cruise sector in Spain is over €1.48 million. Moreover, the number of contracts for the construction of specialised vessels has also increased in Spain. In terms of compensated gross tonnage, Spain is the first country in the European Union, third in the world, in construction of vessels for the fishing industry, the second country in the world in the construction of oceanographic research vessels and second country in the EU in tugboats. Of the total of vessels being constructed in Spanish shipyards, among others, 39 per cent are for the fishing industry, 26 per cent are tugboats, 9 per cent are passenger vessels and 6 per cent are tankers. In addition, Spanish shipyards focus on vessel maintenance and repairs increased their turnover by more than 5 per cent. While it is true that there is an oversupply in the construction, maintenance and repairs of vessels worldwide, the strict environmental regulations that are coming into force in European, North America and Asian ports will serve as an incentive for the scrapping and renewal of the most pollutant and obsolete vessels, which could help in balancing the market situation. Spanish shipyards are an example of constant innovation and ongoing adaptation to the market and have constructed the first three big tugs in Europe driven by liquefied natural gas and diesel. Furthermore, Spanish companies are developing and helping to investigate other technological and innovative projects that will have a great impact in the industry. This is the case of the projects to improve the operational safety of maritime transport using satellite navigation technology. Another example is the research centre that will be installed in Spain to help develop the hyperloop project. The hyperloop will allow to transport containers that have arrived at the port of Valencia to Madrid in 30 minutes, where today this transport is normally done by rail and takes around five hours. PM & FJZ: The escalating trade dispute between the United States and the European Union is a significant international political development. We have already seen how the US administration has imposed tariffs on certain products and how the EU has retaliated with trade barriers. Nonetheless, the real fear is not the impact of these first measures, but the possibility that this spiral of protectionism is the beginning of a trade war on a global scale, which will have a damaging impact on the global shipping market and not just Spain. In parallel, as the US is taking a step back, China is occupying these spaces. The Mediterranean Sea is an area of special interest for Chinese companies. A few years ago, Chinese companies acquired Greek ports so that once they entered through the Suez Canal they could better transport their products to Eastern Europe. Recently, the Chinese company COSCO Shipping Ports bought 51 per cent of Noatum, the leading operator of port terminals in Spain, including the ports of Valencia, Bilbao and Las Palmas and the dry ports of Madrid and Zaragoza, with the idea of entering Europe from the south. This Chinese strategic plan of investing in Spanish ports and infrastructure will be to the detriment of northern European ports such as Rotterdam or Hamburg. Furthermore, as the withdrawal date of the United Kingdom’s exit from the EU approaches (March 2019, unless a ratified withdrawal agreement establishes another date), it is important to understand the legal repercussions this will have once the UK becomes a ‘third country’. Unless a transitional arrangement is agreed, as of the withdrawal date, EU laws will cease to apply to the United Kingdom. The consequences in the shipping market will be considerable. For example, all scheduled services falling within the scope of article 6 of Regulation (EC) No. 725/2004 of the European Parliament and of the Council of 31 March 2004, on enhancing ship and port facility security, such as ferry links between the United Kingdom and Spain, will be subjected to the mandatory provision of security information set out therein. Other examples of Brexit’s effects include the end of non-discriminatory access to provision of public maritime services and port services, and the end of mutual recognition of seafarers’ certificates and marine equipment approvals. Elsewhere, following Commission Regulation (EU) No. 651/2014, of 17 June 2014, the Spanish government issued several royal decrees with the aim of officially supporting the maritime construction industry in respect of research, development and innovation and the access to export credits for the construction of vessels. PM & FJZ: The primary source of innovation in respect of regulatory and compliance issues continues to be the Spanish Navigation Act 2014 (SNA). The SNA was the product of years of negotiation and debate between the Spanish parliamentary draftsmen, interested committees and vested private maritime interests and it is widely regarded as having brought Spain’s maritime legislation from the 19th to 21st century. Regulatory developments have been marked not only by domestic change but also by international developments. Stevedoring arrangements in Spain have received much attention from the European Commission (EC), creating significant tension between the traditional suppliers of stevedoring services and port authorities. Spain has, in recent years, been an active signatory of international instruments of maritime law including, most recently the Rotterdam Rules having been joined only recently by Holland as one of the few European nations to have ratified the same. In respect of carriage of goods, therefore, article 277 (2) of the SNA provides that, in respect of contracts for the carriage of goods by sea, whether domestic or international, the rights under the bill of lading and the liability of the carrier continues to be governed by the International Convention for the Unification of Certain Rules of Law relating to Bills of Lading, signed in Brussels on 25 August 1924. But once the Rotterdam Rules come into force, then the legal framework will change, including provisions relating to, most importantly, the liability regime in multimodal (involving a phase of sea carriage) transport. In addition to the obligations assumed by virtue of its ratification of the Athens Convention, the Athens 2002 protocol has become widely applicable to the carriage of passengers in Spain since 31 December 2012 by reason of the operation of EU Council Regulation 392/2009. This EU regulation, intended by Europe to dynamise the protocol of 2002 on the carriage of passengers and the International Maritime Organization guidelines for implementation of the Athens Convention adopted in 2006, is now fully applicable in Spain and further applies to ships of classes A and B pursuant to Council Directive No. 98/18/EC of 17 March 1998 on safety rules and standards for passenger ships. A significant element of regulatory change (and source of uncertainty and tension) has been the reform of the system of stevedores in Spanish ports. Spain was reluctantly drawn into reform of the stevedoring sector by reason of enforcement proceedings brought by the EC destined to achieve the liberalisation of the port services. Prior to the reform, there existed a monopoly over the supply of stevedoring services, and the hiring of stevedores, a monopoly that was finally addressed by way of Royal Decree 8/2017 and which provokes continued threats of and actual industrial by the established stevedoring companies and the stevedoring unions. In a market where transport by sea is a vital part of the national infrastructure, and which has seen a significant growth in container traffic, the legal insecurity caused is to be deprecated and will hopefully be resolved as a priority. The Ballast Water Management Convention, which was ratified by Spain by means of Instrument of Ratification dated 20 July 2005, entered into force on 8 September 2017 by virtue of its publication in the Spanish Official State Gazette on 22 November 2016. Not quite a year from its entry into force, no significant enforcement activity by the Spanish authorities can be reported. Further international developments in container traffic have been introduced by the Resolution of the Directorate of the Merchant Marine of 16 June 2016, which introduced the new SOLAS container mass verification requirements although again, no significant regulatory impact can be reported from the same. In the area of port state control, a function reserved to the Directorate of the Merchant Marine, and specifically their agents in this respect, the Harbour Masters, while historically there have been complaints of overzealous and unnecessary attention being directed to merchant vessels by the accredited inspectors, this has diminished, although there has been an increase in the inspection and sectioning of vessels for non-compliance with emissions controls and specification of sulphur content in hydrocarbons burned on board. In spite of the broadness of the language used in the Maritime Labour Convention, and its potential effect on the maritime employment relationships, no particular regulatory disturbance can be reported to date, although it may be noted that for vessels flying the Spanish flag, the Directorate of the Merchant Marine issued a clarification, on 18 April 2013, that the categories of persons who are not to be considered ‘seafarers’ for the purpose of the convention, which has done much to promote legal certainty in respect of this instrument. PM & FJZ: Traditionally, the Spanish shipping industry’s main source of credit have been Spanish banks. Despite some uncertainty flowing from previous tax lease scheme, and the challenges thereto under European legislation, this had been largely addressed by the ‘new’ scheme launched in 2012. Uncertainty has once again arisen, however, by the recent decision of European Court of Justice (ECJ) overturned a decision of the General Court of the European Union (GC), which had itself annulled the decision of the EC on December 17 2015 (Joined Case T-515/13 and T-719/13, Spain and Others v Commission). The EC decision had determined that certain tax measures associated with the Spanish tax lease system constituted illegal state aid and were partially incompatible with the internal market. The matter has been referred back to the general court. The Spanish tax lease system, which was seen as very favourable to the tax shipbuilding industry, will doubtless suffer from this uncertainty, as will the ship sector. The regulatory frame for the financing of new builds has certainly improved with the modernisation of the applicable legislation in the SNA. 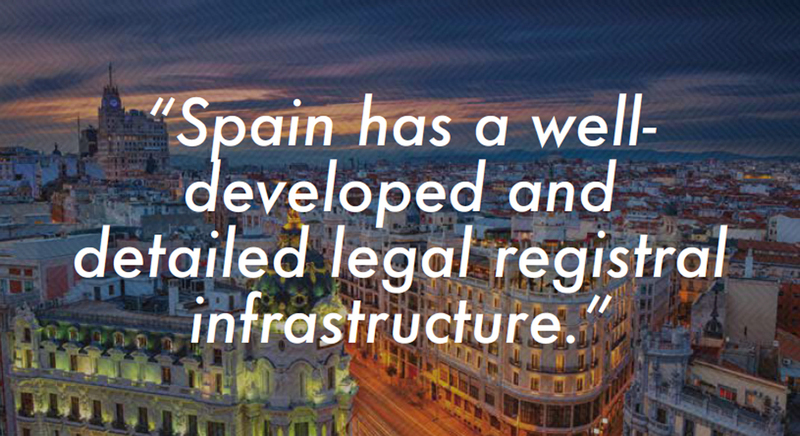 Spain has a well-developed and detailed legal registral infrastructure for the protection of the interests of those financing ship purchase and ship-building. It has two merchant registries, the ordinary registry and a second registry based in the Canaries that offers significant tax benefits but that require specific corporate structures in order to have the benefit of the same. Further, flexibility is introduced by article 94 of the SNA, which permits, in certain circumstances, a Spanish vessel to be temporarily flagged in the place of residence of the charterer for the duration of the charter and for any other type of chartering contract that temporarily transfers possession of the vessel. An advantage to those seeking ship finance in Spain is the degree to which Spain can be said to have a transparent framework as regards the rights of priorities of the financiers of ships. Spain is a signatory of and has implemented the Geneva Convention on Maritime Liens and Mortgages 1993, which some regard as offering greater certainty and definition to the marine financier. Spain is also one of the few states to have ratified and implemented the Arrest Convention 1999. By way of overall comment, it seems undeniable that the most recent decision of the ECJ will have a negative effect on Spanish ship finance, due to its dependence on the aforementioned tax lease system. PM & FJZ: The following are the most significant decisions issued by either European and Spanish courts that have caught our attention recently. In connection with the recent SNA, the Commercial Court of Palma de Mallorca issued on 14 July 2016 (Stc 234/2016) a resolution of great relevance, as the court expressly confirmed the availability for claimants to exercise a direct action against P&I insurers, either alongside an action exercised against the policyholder or individually. While this possibility existed before the enactment of the SNA – as it was covered under the generic Spanish Insurance Act – it referred only to third-party liability insurers and not to P&Is. The decision issued by the Court of Appeal of Valencia (secc 9th) [Rec 450/2016, Rec] on 27 July 2016, expressly made reference to the fact that notwithstanding Spanish and EU regulations, providing that the parties to a contract can negotiate the law and jurisdiction governing that contract, this option will only be available while the UK remains in the EU. The court followed the application of article 468 of the SNA, which provides that clauses of submission to a foreign jurisdiction or arbitration abroad shall be null and void and considered not to be included when they have not been negotiated individually and separately. Our new law further provides that the insertion of a jurisdiction or arbitration clause in the printed conditions of any of the contracts referred to in the previous paragraph shall not provide evidence, by itself, of fulfilment of the requisites established therein. This is of course without prejudice to the terms foreseen in the international conventions in force in Spain and the provisions of the European Union. Spain is a signatory country of the New York Convention and the courts will guarantee its full applicability. The same will apply to jurisdiction clauses in favour of a EU court but not to non-EU courts. More recently, the ECJ issued a decision of great importance for Spanish shipbuilding and its tax benefits [Case C-128/16 P, Commission v Spain and others, 25 July 2018]. From May 2006, the EC received complaints against the Spanish tax lease system, which – allegedly – allowed shipping companies to benefit from a 20–30 per cent price reduction when purchasing ships constructed by Spanish shipyards. On 17 July 2013, the EC decided that these Spanish fiscal measures constituted illegal state aid to companies economically interested in the purchase, ordering the recovery of the aid received by investors. The decision was later appealed by Spain (and some companies that benefited from the tax lease) to the General Court (GC). The GC’s decision, which annulled the European Commission’s (EC) previous decision, issued on 17 December, 2015. The EC appealed this decision to the ECJ and now (two and a half years later), the ECJ has finally reached a decision that overturns the decision of the GC and remits the matter back to the GC for the lower court to reconsider the matter in line with its judgment. Although this decision will not affect the ‘modified tax lease system’ introduced by Spain to palliate the effects of the 2013 EC’s decision, it will definitely affect the shipbuilding industry in Spain and its shipyards. PM & FJZ: As Spain is a member state of the European Union, any consideration that we make in relation to what the future of the shipping market might look like must be approached from a double point of view. Firstly, considering Spain individually, and secondly, considering Spain as a part of the European Union. There are some key features that make Spain’s shipping market a potential winning area to bet for its future. Firstly, following the recent legislation, Spanish stevedores will undoubtedly affect positively the quality of stowage services, while reducing transport prices for shippers and consignees. Notwithstanding the above, Spain’s ports should keep a wary eye on Tanger-Med and the difficult competition that this non-EU port poses for any Mediterranean port. Moreover, Spain is one of the six EU countries (along with France, Italy, Slovenia, Croatia and Hungary) that will benefit from the Mediterranean Corridor Development Plan 2020 (now moved to 2030), which is approximately 3,500 kilometres long, and will provide a multimodal transport connection between Western Mediterranean ports and the heart of the EU. According to the Spanish lobby pushing to fulfil this EU project, it will positively affect over 54 per cent of EU citizens as well as 66 per cent of EU’s GDP. This project will reduce prices on goods being transported between EU countries, and will undoubtedly increase tourism in the regions benefiting from it. The Mediterranean Project is being developed within the trans-European transport network, which is directed to unify Europe’s coastline boosting growth and competitiveness in Europe’s single market. Finally, in a market where there is an increasing awareness of the potential of LNG as marine fuel in a regulatory environment with ever more stringent emissions controls, progress is being made in the development of this energy source. Balearia is the first Spanish shipowner to adapt one of its passenger vessels to this fuel although given that Spain is a member state of the EU, there are relevant rules with which any EU shipowner must comply when converting to LNG and which regulate such a conversion. In addition to this, the former Spanish company Naturgy is one of the leading suppliers of LNG. Effective shipping lawyers must have a sound knowledge of the applicable substantive and procedural law that will help to guide clients along the best potential course of action, together with a general knowledge and understanding of foreign laws that may assist to evaluate other available and more favourable options in other jurisdictions. Due to the international nature of the shipping business, working on a 24/7 basis is also required, together with the capability to lead teams and work from different backgrounds and locations. A last, but still truly relevant, skill is imagination. An effective shipping lawyer must be able to provide solutions and think out of the box, to provide clients with innovative solutions that, despite being grounded on the applicable law, may set the path to new case law. A safe and sound jurisdiction will undoubtedly create an adequate environment for profitable financial operations. Despite some degree of uncertainty due to the recent decision of Grand Chamber of EU on the Joined Case T-515/13 and T-719/13, the outcome of this should only affect previous finance operations, whereas the new tax lease scheme, launched in 2012, received a decisive endorsement from the EU Court of Justice, which dismissed the case brought by Netherlands Maritime Technology against the European Commission’s decision of 20 November 2012, approving such tax lease system. On top of that, players in the finance sector must perceive a flexible, safe and active system that allows players to interact and provides efficient and ad hoc solutions to the different scope of situations (ie, defaults, insolvencies, etc). We have been involved in some very interesting cases (some are still ongoing) in the past year. A court in Spain had the opportunity to render a judgment on a multi-million liability coverage case, involving the owners of a floating production storage and offloading vessel and their insurers against the liability insurer of a Spanish manufacturer of one of its key elements. Another court has condemned, after more than four years of proceedings (due to the intervention of witnesses and experts from many different jurisdictions) a major freight forwarder for the relevant demurrages incurred by nearly 70 containers at port of destination in Iran. Although this judgment has already been appealed, it sets a clear and accurate view on the interpretation of the time bar regime, applicable to actions related to demurrages, calculation of these and, more importantly, liability of the involved freight forwarder independently of its inclusion – or not – in the bills of lading. Last but not least, there was the matter of a fire on board a ferry vessel, which resulted in the constructive total loss of said vessel. The fire exemption of the Hague Visby rules, against the claims instigated by different cargo interests, will be tested by the court in Palma de Mallorca in the following months.